Dr Brian Lee is the Director of the Software Research Institute and holds a PhD from Trinity College Dublin the application of programmable networking for network management. He has over 20 years experience in fixed and mobile network management and has extensive experience of systems and software design and development for large telecommunications products. 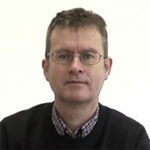 He has managed numerous internal and external projects including Celtic Plus projects and has been task and WP leader on both EU and Celtic projects. He was previously director of research for LM Ericsson Ireland with responsibility for overseeing all research activities including external collaborations and relationship management. His research interests include programmable networking for network management (especially wrt to SDN) and distributed data analytics for infrastructure management.